Process - Tropical Bottling Co. Tropical Bottling provides cold fill processing in a variety of packaging formats. The cold filled container is pressurized by cooling the product and adding the product to the container. Cold filling is the most common filling procedure and represents the vast majority of the request we receive. Cold fill is most often used for sodas, energy drinks, sparking water, and other types of carbonated beverages. We pasteurize our beverages through heat-exchange, or PIP (pipe-in-pipe), versus tunnel pasteurization. 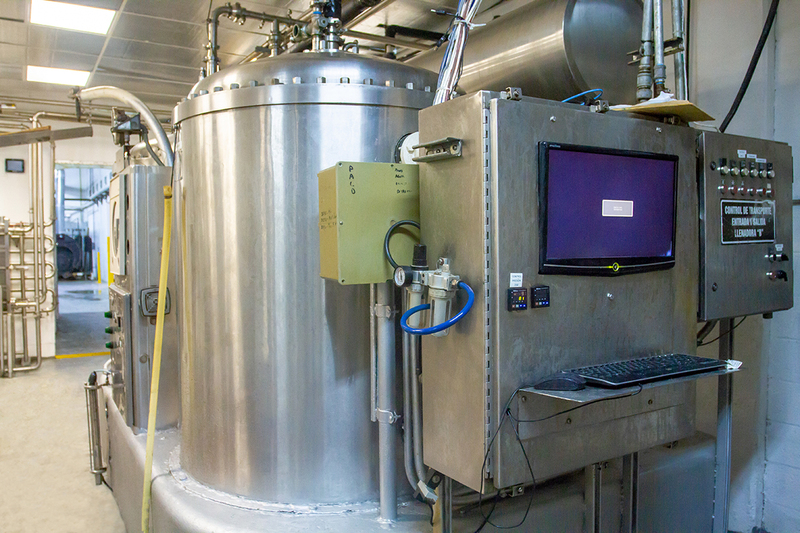 This method of pasteurization is critical for products that are particularly temperature sensitive. Our HTST (hot temp / short time) heat exchanger allows us to expertly produce a wide range of products while ensuring the quality of production. We also feature reverse osmosis water treatment. Reverse osmosis allows the water being mixed with the beverage’s ingredients to be filtered and purified. Not all beverages require reverse osmosis, but should your specifications call for the most purified water available, Tropical Bottling Company has the capabilities to deliver. We can help you save money on pre-printed cans by offering in-house or 3rd-party labeling services. Can labels often allow for more graphic detail and help new beverage makers manage costs. We are happy to custom configure pallets to your quantity and flavor specifications.